Back in February, I signed up for Anne Ditmeyer's online Map Making class on an impulse. That decision turned out to be a very good one because I had lots of fun and the class got me thinking about maps in new, creative ways. And because everyone had a different approach to the map tasks, I got lots of inspiration just from checking out my classmates' projects. 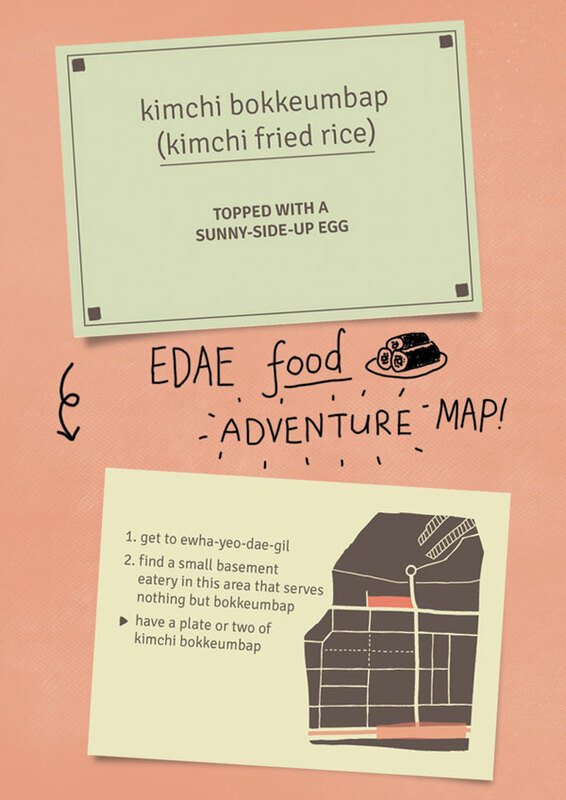 The idea was to create a series of cards with clues & a map on each of them that would lead you to my favourite spots & restaurants around the E-dae area in Seoul, South Korea. I didn't even manage to finish designing cards for all the locations I had in mind when the class ended, so it was a nice surprise to find out that my little project had been included in Anne's 'Best of Maps!' roundup. Thanks, Anne! She'll be teaching the class again, starting on 28 May, and I highly recommend it for anyone who is interested in travel, design, or maps! This post isn't sponsored, I just really enjoyed taking this class :) I'm sure it'll be a bit different this time around, but if you want to have a rough idea of what it will be like, have a look at my project page. A map quilt is such a lovely idea. I think it would make a great childhood keepsake or holiday souvenir!